You will need to gather 4 boxes of various sizes. You could use shoe boxes, book boxes, and/or appliance boxes. The different sizes help to differentiate between learners. Students who can be challenged can use a bigger box, while perhaps some students only do the smaller boxes. 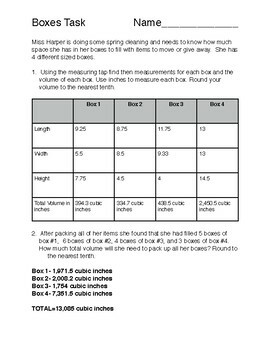 The students will need measuring tape (I got multiple at the dollar store) or rulers to be able to measure the actual dimensions of the boxes. This activity take volume to a much more application level. 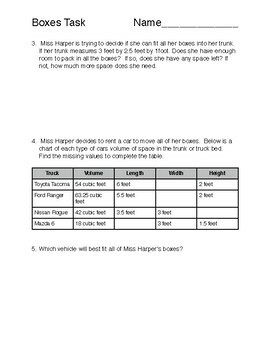 Asking questions that require the students to find missing lengths, decide on best fit, and justify their work. Great extension activity too. The answer key will vary based on the size of boxes you use, but I attached mine for reference.